The radical vegan movement is at it again – telling porkies (pardon the meaty pun). We live in an era of fake news. The trouble is that vulnerable and/or uninformed people often believe them. A widely circulated vegan report recently claimed that it takes 1,000 litres of water to produce one litre of milk. Another site says that it takes 5,000 to 20,000 litres to produce a kilo of beef. No, it doesn’t! They pee almost all of it back out which goes into the pasture as enriched urine. Currently I am milking a couple of house cows and I know how much they drink because I am filling their trough by hand from a rainwater tank. The trough in the photo is half of a 200 litre drum and I fill it mainly from the rainwater tank in the photo which I occasionally have to top up from our bore. For a lot of the year they don’t use the trough, they just drink rainwater water from ditches and puddles. 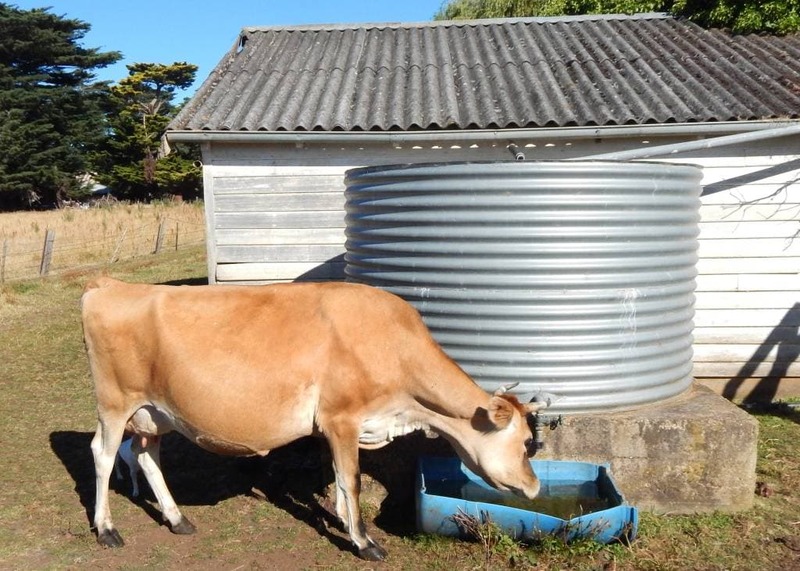 So I fill this trough twice a day – and they are giving me milk as well, around 10 litres per day each. I share the milk with the calves and only milk once a day – some days not at all. Now it wouldn’t matter if they drank 100 times as much water because, naturally, it passes though them. Vegans don’t seem to have grasped this concept. They appear to think that the water that the cattle drink is lost to the environment. Sounds like the usual misguided beef with vegans. Confusing drinking water with irrigation water sounds a little nutty. I find it hilarious that dairy farmers can’t compete with nut milkers. In terms of a well researched article proving vegans tell porkies, zero stars. And the dairy farmers cannot compete with horticulture. How many litres of water from the Murray Darling system does it take to grow a litre of that nut juice the vegans reckon is morally superior to genuine milk? Simon, your comment makes no sense at all. It may be a side issue Steven, but I would think more than twice about using the rainwater from the tank shown in your photo. That shed roof is a seriously degrading Asbestos Cement roof. As such there would be quite a bit of asbestos contamination in the water. I know that so far we have only been told of the dangers of breathing in asbestos dust, but if a material has barbed fibres that stick in our lungs and cause tumors then I would suggest that those same barbed fibres would have the potential to cause stomach and bowel tumors as well. I would get rid of the roof or the tank if they were mine. Well spotted Pete. What future for Lulu now ? May as well pack her off to Wittenoom Gorge to live out life. Russell and Pete are correct.The issue in contention is the water that is used is for the irrigation of pasture. However, I look at this issue more broadly. For hundreds of thousands of years humans have killed animals and eaten meat. For most of that time water use was never a problem. The problems of today have only arisen because the human population has grown exponentially. So instead of becoming a vegan, why not just stop breeding? I don’t irrigate my pasture. Most other beef farmers I know don’t either. I do agree with you last point though, Tom. Simon the article is about milk production. Most Dairy farmers irrigate. What people do is their business really. Whether the figures are right is the point of the article. The article made a claim about the amount of water that beef production takes, Pete. Jon, read Pete’s first comment. Northern Victorian farmers are finding it impossible to compete with almond plantations for water, purely on the basis of price. Ahh, Capitalism, is there a problem with that, Simon? No problem with capitalism Jon, just pointing out another perspective so that a better understanding of the true picture can be formed. Dr Karl has an interesting comment on the relative merits of nut juices v dairy milk for another perspective. Not so keen on the water auction system that has allowed speculators with deep pockets to game the market, but that is what happens when politicians who are clueless about competing interests make laws. Sorry about the sequencing but I cannot reply to your comment directly as there is no “reply” button. Simon, I think the reply button lives under the head comment/reply and not on sub-comments/replies. Just guessing – will see where this comment pops up! Personally, I totally reject almond milk it is environmentally a negative – very water hungry and just a trendy drink by thoughtless people (though may consider themselves as ‘mindful’). As well, nutritionally it is pretty much a zero, there is no point to it , though the silly health food fake story of ‘activated almonds’ may be behind the market. Soy milk has time and again been shown to be as nutritional, or more nutritional, than cow milk. As for the market, it is what it is. Farming is a business, not a sentimental myth, and if it can’t survive, it goes under. Jon, once you are past childhood you shouldn’t be drinking milk anyway. All the milks you get in supermarkets aren’t really milk anymore because it has been stripped of all the fats and the over-processing makes them indigestible. Soy milk is full of hormones which is also causing many of today’s health problems. Both these (but in their whole natural form) should ONLY be consumed once they have been properly fermented, which renders all the vitamins and nutrients available to our digestive system. If people are outraged about how much water it takes to produce milk, they will be horrified to learn how much water it takes to grow vegetables. Yes, I think you have to take into consideration how much water it takes to grow the food for your cow to be healthy enough to calve and produce milk. Urine is not just water (where do you think the name for the nitrogen fertiliser Urea comes from?) and if you piss in the same spot a few times it will actually kill the grass with too much nitrogen. Intensive farming is bad for the environment .. as you can see by how many farms lay idle and worthless these days, especially where chemical fertilisers and overstocking has become the normal practice. Processed milk on supermarket shelves is basically indigestible because the extreme heat and pressure processing has killed all the vitamins and made the calcium unusable to the human body. Everything worthwhile has been removed to make processed cheeses, butter, powdered milk, etc. which are largely indigestible as well, and cause major health problems. You shouldn’t be drinking milk once you are past childhood anyway .. unless it is unprocessed and whole and you ferment it to kefir, yoghurt or natural cheese which the human body can use. Pork (all pig products actually) is the worst of all the meats to eat and it is extremely bad for you, especially nowadays with all the nitrates and other poisons they use in its processing. That’s why Jews and Muslims won’t touch it, and The Old Testament forbids it. It’s not just some some religious quirk. Actually, Russell, I have heard three hypotheses for this prohibition .. but really the reason is unknown. The prohibition predates Islam and Judaism. The prohibition against pork entered Islam when that religion simply took up the Judaic prohibition. C – they carry parasites that can infect human hosts (but that is not a strong reason as other animals – horses, cattle, sheep, also carry such parasites). But the main reason is simply that it is in the religious texts, that is all. The most convincing argument I’ve seen is that it was a stricture to help establish social identities to differentiate between Semitic tribes. Archaeology has shown that the Israelites did not feature pig in their herd-based diet, but the Philistines were quite partial to pork. It is speculated that this difference became formulated as a social code in the early forms of Judaism and was placed into their religious texts to maintain this separate tribal identity. But at the end of the day the only reason is that it is written in the Torah and the Qur’an. Just as we know that temperature of Hell is no more and no less than 445 degrees Celcius, since it is written in the Bible that Hell has ‘boiling lakes of sulphur’. Sulphur boils at 445 degrees but vaporises at temperatures higher than that. The only mention of a translated “hell” in the Old Testament is just the place where ALL people go when they are dead. It is a false New Testament concoction of a burning hell for baddies and a gold-paved heaven for goodies to scare the bejesus out of simpletons into being god-fearers. Pigs are regarded as unclean in the Old Testament (which is a historical record, not a religious one) and that’s way before there were any Jews or Muslims. There was no religion as such, just cultures. Islam came from Ishmael, son of Abraham, and the Israelites from Jacob (later renamed Israel), the grandson of Abraham. If anything, Islam was there first because of the obvious generation gap. Anyway, ALL religion is crap and just used as a tool to oppress people and steal or control all their wealth or possessions. It’s more obvious today than ever before. Pigs are filthy animals in both manner and as a food source. They are full of parasites which do not occur in other animals and are especially harmful to humans in particular. They just knew this was so, even thousands of years ago. Modern ‘science’ has proved the same and today’s pig ‘foodstuffs’ are also riddled with nitrates and other dangerous ingredients. The fact that pig meat is banned from being eaten by certain groups is because it is unclean and unhealthy, NOT as a means to identify oneself as a follower of this religion .. except by those zealots of modern times who have lost their connection with or falsely re-interpreted historical texts. The people you talk about may be including the irrigation water that is sprayed on the paddocks of normal dairy farms. There is also a bit of a difference in content between fresh water and urine. In places where water is scarce, such as the Murray Darling basin at the moment, every drop of fresh water counts.